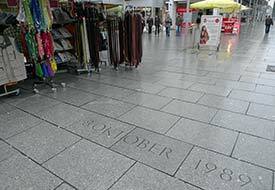 PHOTOS: A pavement inscription on Prager Strasse and a commemorative column pay tribute to the October demonstrations of 1989. Dresden was one many East German cities whose citizens contributed to the "Peaceful Revolution," a movement that led to the opening of the borders between East and West Germany, the collapse of the Berlin Wall, and German reunification in 1990. The first major "Peaceful Revolution" event in Dresden took place on October 4, 1989, when more than 5,000 people formed a procession along Prager Strasse (the main street between Dresden's central railroad station and Altstadt). The crowd moved toward the Hauptbahnhof, where "freedom trains" were scheduled to pass through on their way from Prague to West Germany. (The "freedom trains" carried GDR citizens who had sought refuge at the West German Embassy in Prague.) Some 1,300 people were arrested during the October 4 demonstration or shortly afterwards. Larger demonstrations followed. In nearby Leipzig, an estimated 70,000 protesters marched for freedom on October 9. (See our article on the Leipzig Monday Demonstrations.) On November 4, a million people demonstrated in Berlin, an event that led to the opening of the Berlin Wall on November 9. The GDR had its first free elections on March 18, 1990, and the reunification of Germany formally took place on October 3, 1990. 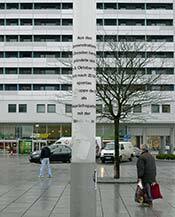 "Visitors can tour Dresden and see places of commemoration relating to that dramatic period. These include writing on the pavement in Prager Strasse, the Kreuzkirche [a site of "peace prayers"], the Frauenkirche [where gatherings took place in front of the old church's ruins], and the propagandist mural Der Weg der roten Fahne ('The Way of the Red Flag') on the side of the Kulturpalast. "Even the Semper Opera played a role in 1989: In her production of Fidelio on October 7, Christine Mielitz put GDR border fences and soldiers on the stage as symbols of a repressive system." Another location that merits a visit is the Gedenkstätte Bautzner Strasse, or Bautzner Street Memorial, the former Stasi interrogation prison for the Dresden District of the GDR's State Security Service. The complex has been preserved in its original state, with interrogation rooms, receiving and transfer facilities, and prison cells. It also houses exhibitions that relate to the GDR, political oppression, and student opposition to the East German regime. The Memorial is open Monday to Friday from 9 a.m.to 4 p.m. or by appointment. Admission is free. Semper Opera photo copyright © DWT/Christoph Münch.